The Noble Quest. Once again, here is one rather unusual game for you. It is about a plot packed into a fairytale that will attract your attention, it is for sure. This game places you in one kingdom that is ruled by the animals that are actually the only citizens. As you may guess, the lion is the king in this kingdom and he does his role really good. However, there is something strange that has happen in this kingdom. Namely, six valuable objects that belong to the lion king are lost. They are hidden somewhere in the kingdom or to be more precise, they are hidden all around the kingdom. Those objects need to be found as soon as possible so the lion king chooses the fox, known all around as the best seeker in that surroundings. The lion king has also promised a good award for her if she manages to find the lost objects. The fox will receive a noble title in return so we are sure that she will give her best in order to gain that prestigious title. Even though the fox counts as the best seeker around, she could use some help from you. You could also take part in this noble quest and look for those objects. 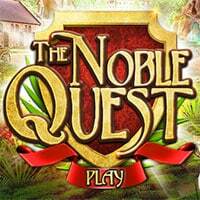 Maybe you won’t get a noble title but you will definitely enjoy the play and have a great time playing The Noble Quest Game.